Pockets full of hipsters and hidden food gems Kreuzberg is far from shy when it comes to expressing itself about the food industry. Even before reunification in 1990, the artistic and bohemian west side suburb was known for its creativity and an eclectic use of space. The grand entryway and roof inside Markthalle Neun. With new concept restaurants cramming their way into a saturated market of old favourites, new meets old in the best grungy yet gentrified Kreuzberg way at Markthalle Neun. The building itself officially opened as a marketplace in 1891 and is one of only three heritage marketplaces remaining in the city. Hermann Blankenstein designed the markets with the foresight of producing larger spaces for bigger markets than the city previously had access to. Painted black to blend into the surroundings, the markthalle survived the war with some minor bullet holes although it took six years after the war finished for the market to reopen to its former glory. 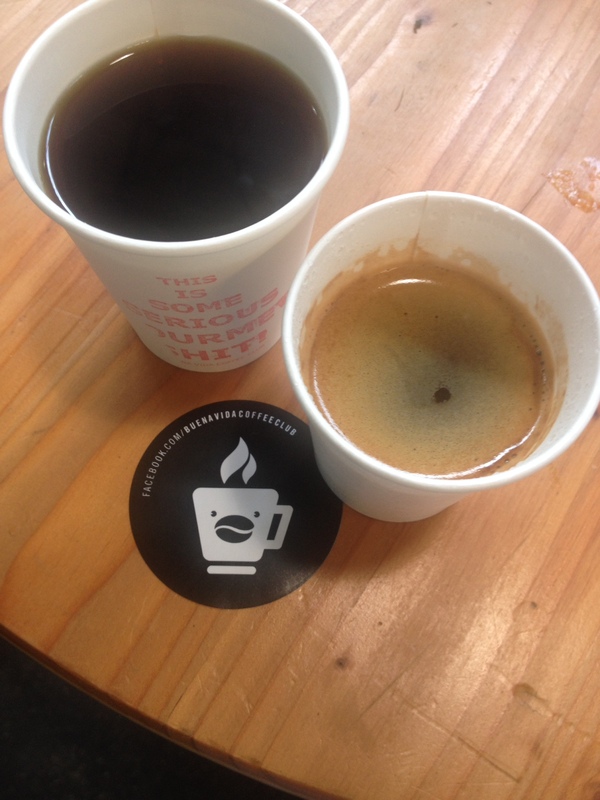 One of the rotating weekend cafes Buena Vida visiting the weekend market. The large market space is intricate with high ceilings and typical copper and iron bars crisscrossing across the roofs surface. Open and light from the ceiling windows some of which are covered with the seasons past, others new and clean albeit short lived. The concrete floors under thick, dominating maroon wooden columns, demonstratea a hardworking space, warm in the colder months but airy throughout the summer time. From the street, you’d hardly noticed the bright, open space tucked away behind the gated entryway, but once inside, the vast space is engulfed with smells of sweets and meats. 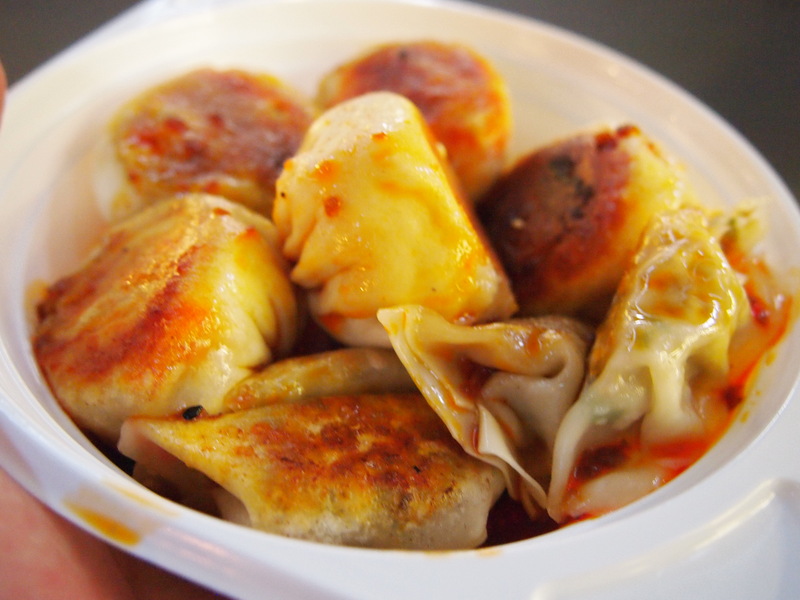 No market visit is complete without dumplings. At Street Food Thursday. Busy with events throughout the year including Berlin Kaffee Fest and the Frühstück markt (every third Sunday of the month, the Markthalle is open on Tuesday and Friday for the Wochenmarkt where regular storeowners including Big Stuff BBQ, Kantine and Sironi sell dine in and takeaway food alongside flowers, kitchen goods and fresh breads. On Thursday evenings from 5pm, Street Food Thursday takes over simulating the Saturday Wochenendmarkt where rotating cafes and series of pop up stalls – based on restaurants around town – cook up a storm on the market floor. Although marked as individual named events, the offerings at Markthalle Neun are repetitive despite the worthwhile produce and diversity of freshly cooked cuisine. 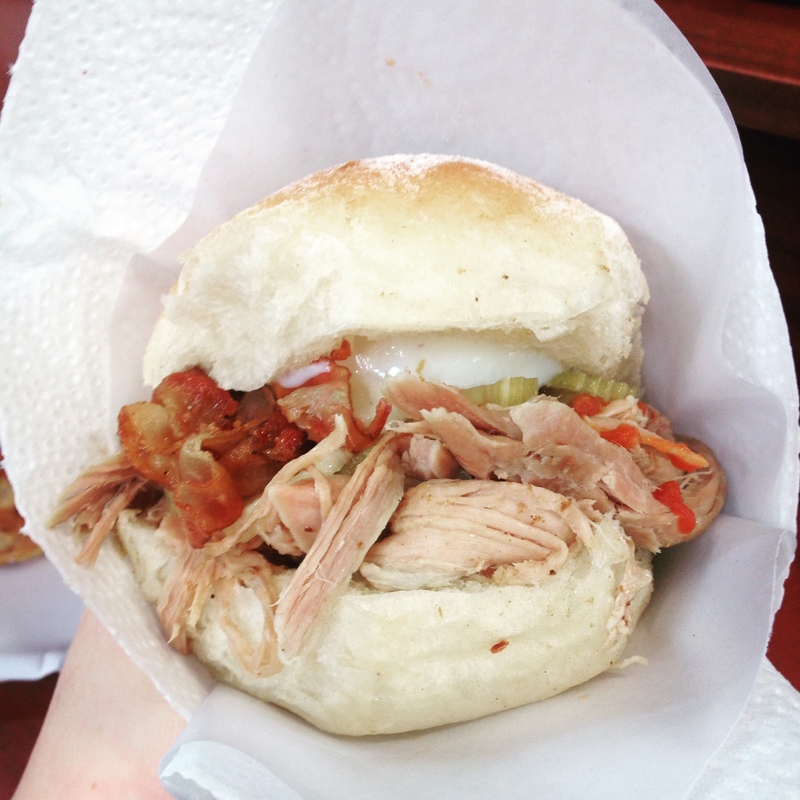 The pulled pork breakfast burger with a poached egg from Big Stuff at the Sunday Breakfast Market. Street Food Thursday is by far the most popular event with seating and much of the food getting snapped up early. To avoid the long lines (children) and standing to eat, head down on Saturday’s for the Wochenendmarkt where you find similar favourites without the stress of crowds. 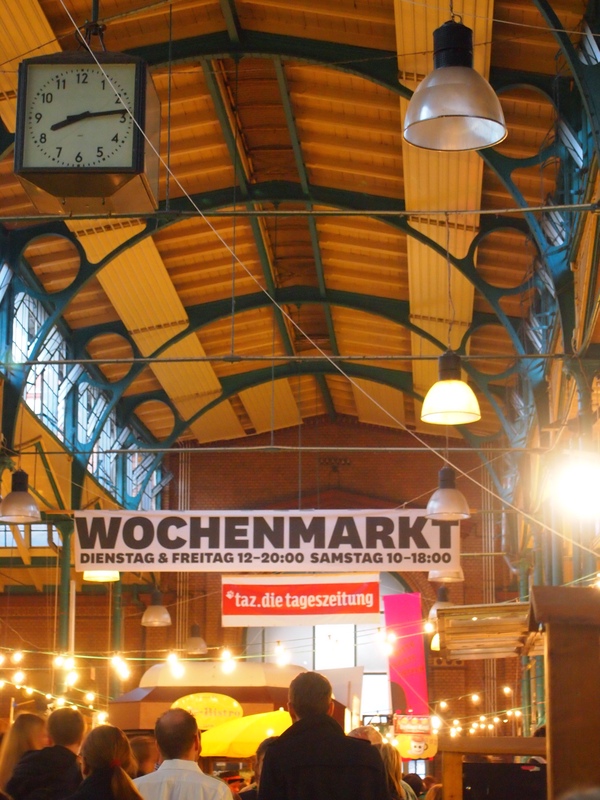 Markthalle Neun is a great place to catch up over a drink and a snack or a heavier meal with friends and proves to be a detailed sample of old and new food flooding into Berlin. 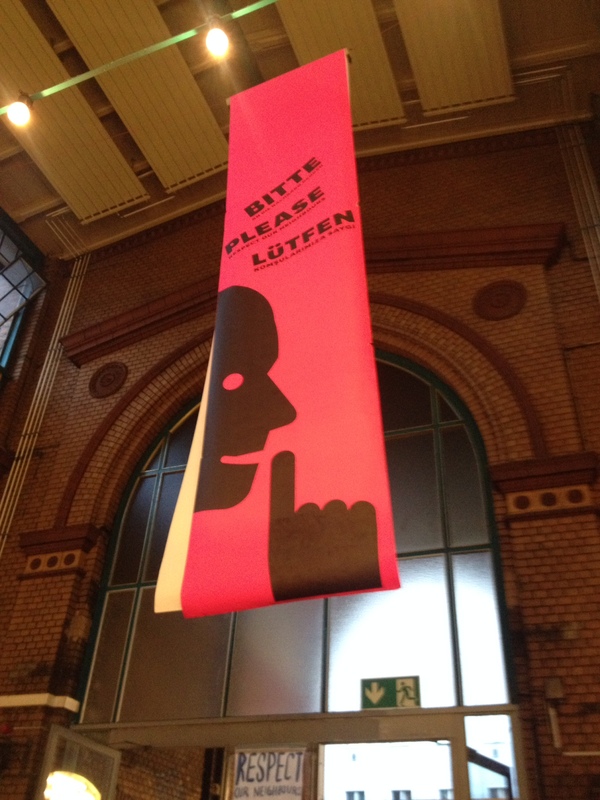 One of the many banners and signs stretched across the roof space.